Gladding-Hearn Shipbuilding, Duclos Corporation, has de- livered the fi rst of six Chesapeake Class pilot boats for coast- al and offshore patrol operations and port security, provided by the Colombian Department of the Navy. Designed by C.
Alaska Diesel genset. At the transom is a winch-operated, rotating davit over the water-level recessed platform for res- cue operations. Interior accommodations include six bunks, a head and full galley, air conditioning, and Llebroc seats and an upholstered settee in the pilothouse. 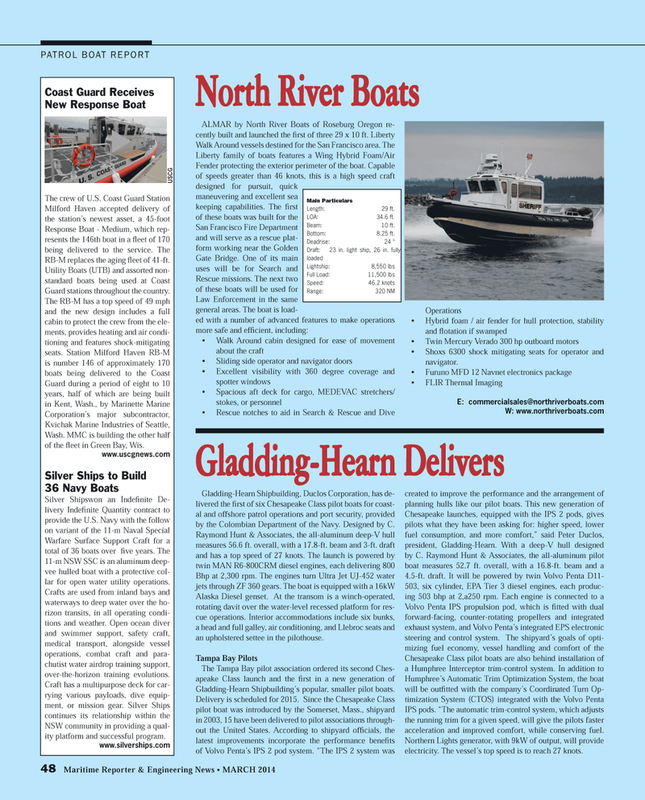 Gladding-Hearn Shipbuilding’s popular, smaller pilot boats. IPS pods. “The automatic trim-control system, which adjusts the running trim for a given speed, will give the pilots faster acceleration and improved comfort, while conserving fuel. Northern Lights generator, with 9kW of output, will provide electricity. The vessel’s top speed is to reach 27 knots. RB-M replaces the aging fl eet of 41-ft.
Guard stations throughout the country. Warfare Surface Support Craft for a total of 36 boats over fi ve years. The 11-m NSW SSC is an aluminum deep- vee hulled boat with a protective col- lar for open water utility operations. Crafts are used from inland bays and waterways to deep water over the ho- rizon transits, in all operating condi- tions and weather. Open ocean diver and swimmer support, safety craft, medical transport, alongside vessel operations, combat craft and para- chutist water airdrop training support, over-the-horizon training evolutions.